Back in college, I got into the habit of taking a long walk everyday and nearly ten years later, I’ve covered a lot of ground on my own two feet. When people hear I’ve been hiking in all 50 states, they often ask: what’s the best trail you’ve ever hiked? Impossible to say. Every place is beautiful and fascinating in its own way and trying to compare the Maine coast to the Canadian Rockies to the desert southwest is like comparing apples to oranges to prickly pear. Behold the San Ysidro Anticline! Once a dome, now a bowl. Geology rules. Cabezon Peak is on the left in the distance. 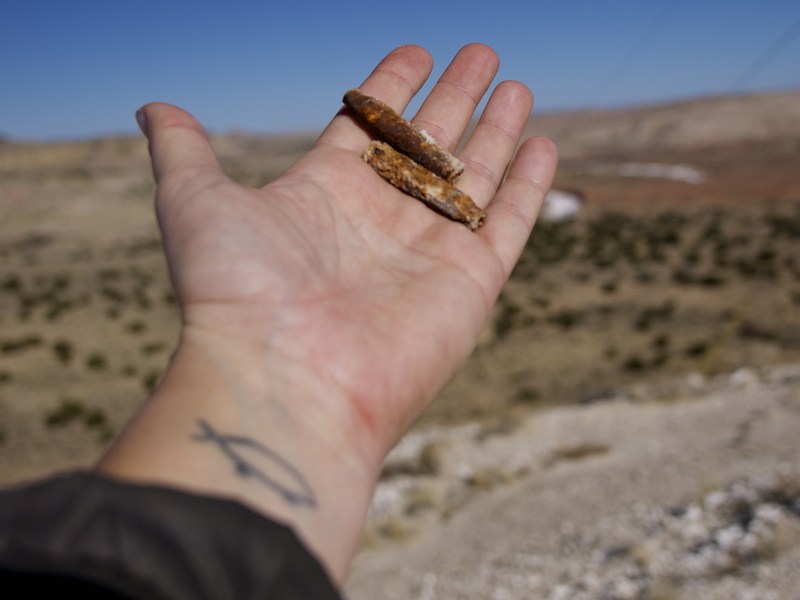 On my first visit to Ojito, I stayed away from the marked paths and explored the off trail areas east of White Mesa. To read about off trail navigation in the desert, check out my previous post Into the Ojito Wilderness. The place was so incredible that I thoroughly enjoyed myself despite near constant machine gun fire across the road. The Wild West lives in the Ojito Wilderness, it seems. This time, I parked the Teardrop in the parking lot for the White Mesa trail system, where I was reasonably sure I wouldn’t be camping in the line of fire and set out to hike the Dragon’s Back. 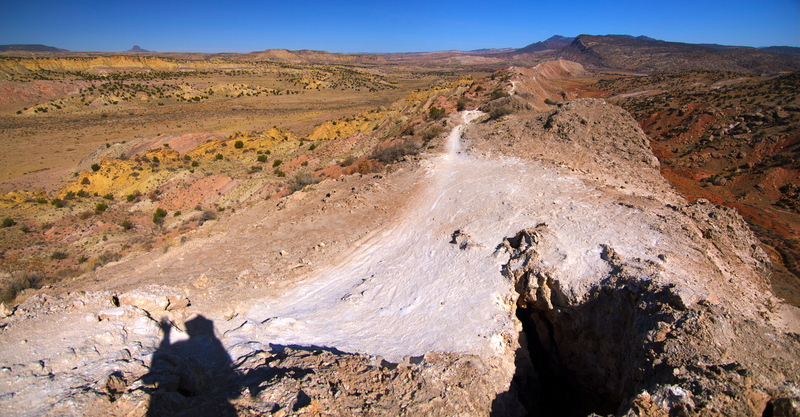 This stark-white trail is carved across the narrow top of a long, narrow gypsum-topped mesa. The Dragon has a head and a tail and a five-mile long undulating back that crosses stunning wide-open country between highway 550 and Cabezon Peak. 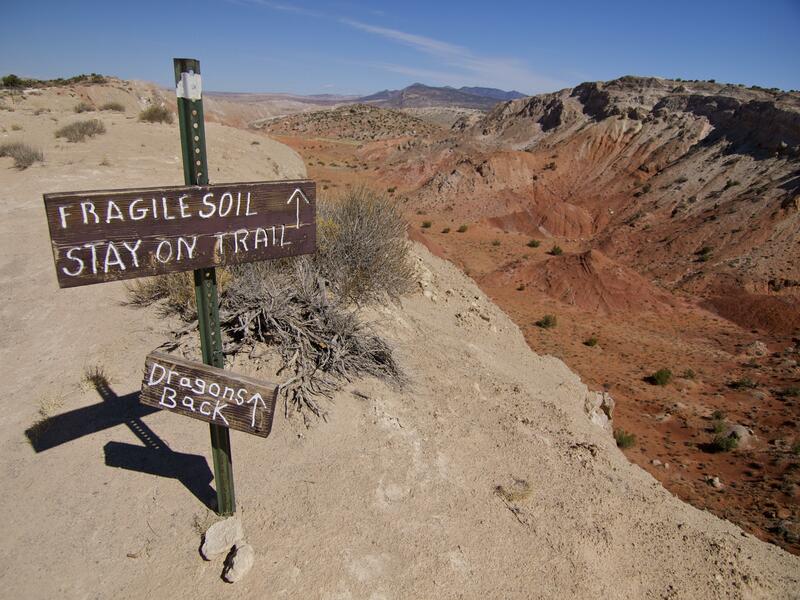 The Dragon’s Back trail is bright white because it crosses the top of a gypsum-rich mesa. Gypsum is water-soluable. There’s not much water in this country, but enough to carve a few disconcerting large and deep sinkholes along the top of the ridge. Approaching the head of the Dragon! 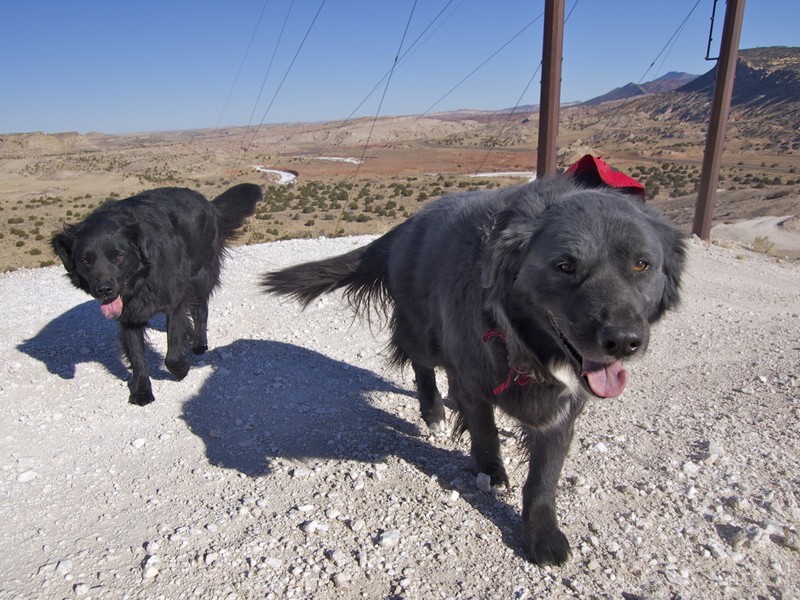 Bowie needed a little boost on that steep section ahead, but Dio scrambled right on up. Summit of the Dragon’s Head. 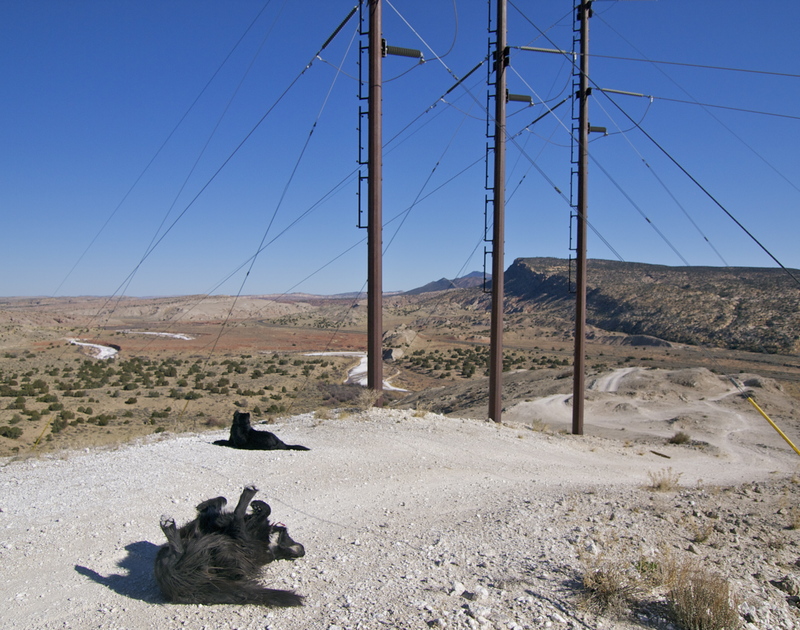 Highway 550 and the salt-white Rio Puerco are below. Juniper & Cabezon. I climbed Cabezon two years ago. Returning along the Dragon’s Back. The tail curls around to the left. 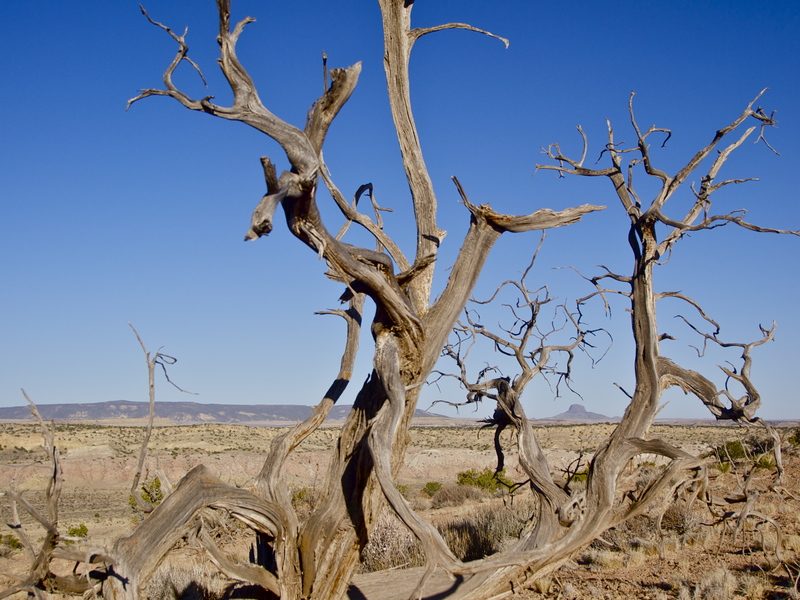 This entry was posted in Bowie & D.O.G., Hiking!, New Mexico, Photography, Road tripping!, Sustainable Living, Teardrop Trailer, Vagabonding 101 and tagged Dragon's Back, Ojito Wilderness, San Ysidro Anticline. Bookmark the permalink. Fragile soil! Great post, best geology lesson I’ve had so far. do you ever worry that your dogs would run across a poisonous snake in the desert? This post caught my eye because I’m headed to the Grand Canyon a month from today! Can’t wait to experience the desert! I have hiked there with my kids once before, but we stayed on the bike trails. A few friends and I have plans to ride our horses there soon. Sounds like the shooting gets pretty annoying, but I’m assuming that the areas that hikers, bikers and horseback riders explore are safe from gunshots? 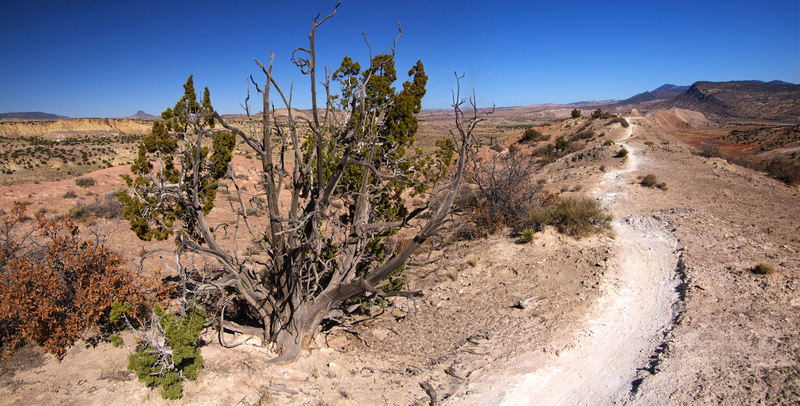 Also wondering if the White Mesa parking area that you camped in can accommodate a horse trailer or two? Ojito Wilderness is only 45 minutes from my house in the Sandia Mountains, so we don’t need to camp out. The hiking areas are across the road from the shooting areas. Hopefully people keep their guns pointed away from the road, but there are a lot of idiots out there. Thanks to the rugged terrain, there’s little line of sight from the shooting area to the hiking area, so I doubt a stray bullet could make it over that way. You could definitely fit a 2-horse trailer or two in the White Mesa lot, as long as it wasn’t full of cars. I think there’s another lot farther down the road for horses, at the horse trailhead, but I didn’t go down that way. Horses are not allowed on the White Mesa bike trails. I don’t blog or twitter but my wife is a huge fan and sends me your various posts. We live in Idyllwild, Ca. that is along the Pacific Crest Trail where many hikers take a needed break. Wish I could accompany my wife on our many trails but suffering from back pain and at 67 yrs. finding walking any distance too painful; this from a guy who spent my lunch hour at Scripps Institution of Oceanography running up and down Black’s Beach for more than 30 years therein La Jolla. Knew Roger Revelle, Bill Menard, Marcia McNutt, Walter Munk and other great earth scientists thruout my nearly 40 years there. (worked on the International Hydrographic Organization Underseas Naming committee) (Have a seismology recording device on our Idyllwild property as part of the Anza array network set up by San Jacinto fault expert Frank Vernon, IGPP). Best of luck. Love your dogs. Loved your description of your visits to the Ojito. I hiked the Dragon’s back last Thursday with my Rez dog, Chula. I was so freaked out at the exposure, the soft soil, sink holes and sheer drop offs I kept Chula on a short leash! I loved the view, but I kept imagining my dog rolling 200 + feet down either side. About half way to the head, we found a faint trail that led down and to the west. There are very few spots where one can descend safely. As you describe, the place is amazing, unique, beautiful, weird, jumbled and yes, I’m going back for more. Just so that you know, the gunfire happens on weekdays as well, but I never heard anything whizzing by.